1. San Diego Archers are responsible for and are expected to assist in the maintenance of both the field range in Balboa Park and the target range at Morley Field by attending the monthly work parties. 2. Attend all club meetings. 3. Promote archery and conduct themselves according to the code of sportsmanship at all times. 4. Members must assist in the promotion of archery and should conduct themselves according to the code of sportsmanship at all times. 5. Observe all archery safety rules. No blunts, broad-heads or crossbows are allowed. Ensure guests and visitors on the range also observe these safety rules and practices. 6. While bow-hunting, conduct themselves according to all regulations, cooperating with game officials, practicing conservation and bring credit to the San Diego Archers. All members and participants in any SDA tournament must submit a signed waiver each year. All participants in the Annual King Arthur Tournament must submit a separately signed waiver each year. ☞ Click Here to Pay Online Now? The daily range fee for both the Balboa Park Rube Powell Archery Range and Morley Field Ranges is $2.00 a day or $19 a calendar month. 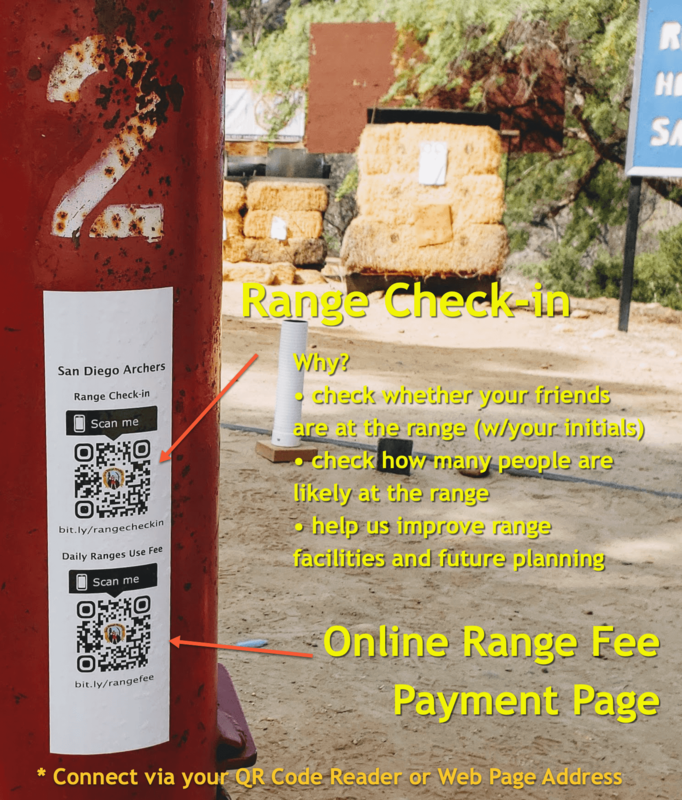 Range fees are due “before” shooting on either range, and may be paid at the range entrance via the metal pole with cash payment slot at the top, or range fees may be paid online. No “person” will accept payment for range use except during official tournaments. Your check-in will help the San Diego Archers Club improve our ranges. Please check-in before shooting. Personal information will never be made public, sold or shared.